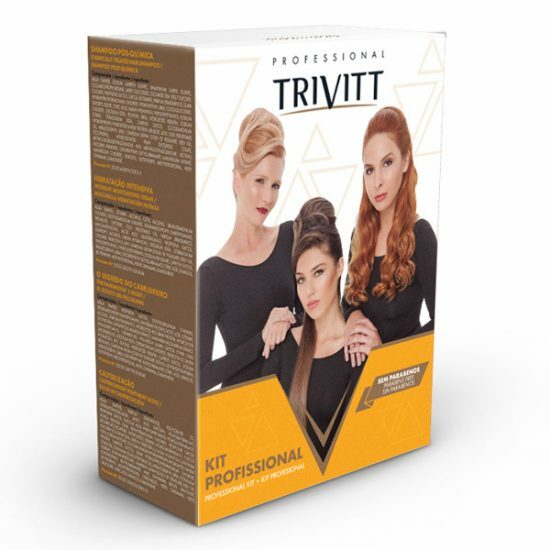 Developed from natural elements among technological active ingredients, Trivitt line provides deep hydration, cauterization, damage repair and highlights natural shine of the hair. 01 CHEMICALLY TREATED HAIR SHAMPOO FOR FREQUENT USE 33.82 fl. oz. 01 INTENSIVE MOISTURIZING CREAM Net Wt. 35.27 oz. 01 INSTANT RECONSTRUCTOR FLUID – THE HAIRDRESSER´S SECRET 10.14 fl. oz. 01 CAUTERIZATION TREATMENT GLOSS 10.14 fl. oz. 01 STEP BY STEP BACKWASH.